6 piece Medium sanding sleeve set for use with Clarke COBS1bobbin sander. This set includes sleeve sizes ½", ¾", 1",1 ½", 2" for use with COEBS1 Oscillating belt and bobbin sander. 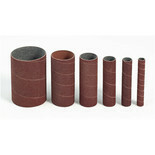 6 piece Fine sanding sleeve set for use with Clarke COBS1bobbin sander. 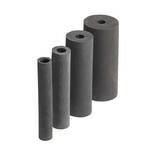 6 piece Coarse sanding sleeve set for use with Clarke COBS1bobbin sander. 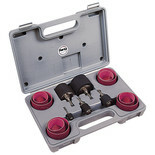 This set is designed for use with the Clarke COEBS1 Belt & Bobbin Sander. 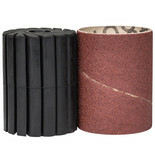 This set includes drum sizes ¾", 1",1 1/2", 2" for use with COEBS1 Oscillating belt and bobbin sander. 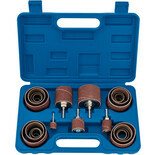 The Clarke 15mm sanding roller from Bosch are suitable for use with the PRR 250 multi sander. 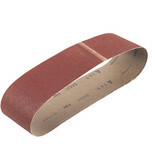 Set of sanding sheets for the PRR 250 ES sanding roller, for sanding flat surfaces, door frames, stairs and garden furniture. 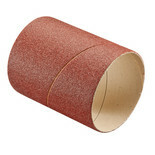 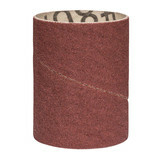 The Bosch 1600A0014P SH 60 K80 sanding sleeve - 80 grit for use with the Bosch PRR 250 ES sander roller. 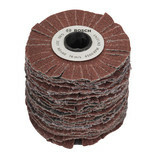 The 60mm sanding sleeve from Bosch are suitable for use with the PRR250 multi sanders.